After reading the last post, "Periodontitis and Peri-implantitis - What's the Difference", a reader asked, "What do you propose for a good periodontal maintenance program?" regarding implants. The following article addresses that question. During the past three decades replacement of missing teeth with implant supported restorations has become increasingly common. Dental implant placement is a viable option for both complete and partially edentulous cases, and is often the treatment of choice. While implant supported restorations do not share the risk of dental caries that natural teeth are subject to, they are susceptible to peri-implant mucositis and peri-implantitis, just as the natural dentition is subject to gingivitis and periodontitis. It is well established that periodic periodontal maintenance can optimize the long-term prognosis of the natural dentition. Like-wise, successful dental implant therapy must include an appropriate recall program. This article will review the similarities and differences of the hard and soft supporting tissues of natural teeth and dental implants, discuss the etiology and pathogenesis of peri-implant mucositis and peri-implantitis, and present a protocol for a comprehensive implant maintenance program. 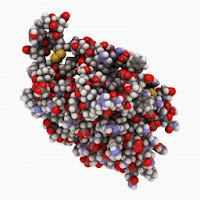 IL-6 has pro-inflammatory effects and is responsible for collagen resorption of gingival tissues,32 while IL-10 is an inhibitor of inflammation.33 Other cytokines, such as IL-12 appear to induce the secretion of IFN-g from activated T and NK cells,34 and IL-8 acts as potent chemoattractant for neuthrophils35 in gingival tissues. The continuous balance that exists between the host immune response and potential subgingival pathogens (bacteria / viruses) determines the clinical condition, not only around teeth, but also around osseointegrated dental implants. Nowzari et al. analyzed the production of cytokines around clinically healthy teeth and dental implants and examined their relationship to putative periodontal pathogens.36 Although no specific microbiological profile was observed, teeth allowed for more colonization by P. gingivalis, T. forsythia, Fusobacterium spp. Microscopic structural differences between dental and implant surfaces could account for this finding. There is no information available on the detection of HCMV around healthy dental implants. In contrast to implants, HCMV has been detected in low frequencies around periodontally healthy teeth. Nowzari et al. did not detect HCMV around healthy dental implants using nested PCR. 36 The absence of prominent inflammation could help explain this result. Studies addressing a potential pathologic role of HCMV around implants are needed. A tendency towards more cytokine production was observed around implants in contrast to teeth, but a specific explanation for this finding is not available.37 It can be implied that an implant acts as a foreign object and results in cytokine secretion. This raises the issue of an immune response against the chemical components of the implant. Perala et al.38 indicated that dental implant surfaces may lead to an activation of human peripheral blood mononuclear cells for the secretion of IL-1b and TNF-a. Titanium particles in vitro have been shown to influence release of IL-2, TNF-a and IL-6.39 Sedarat et al.40 in an in vitro controlled experiment exposed titanium implants to an environment similar to in vivo conditions and measured 16 (± 5) ng/cm2/day dissolution of titanium and titanium alloy over a 96-day period. The dissolution of titanium / titanium alloy and the ions released by the atomic process of biodegradation can explain, at least in part, the presence of cytokines where no microbial pathogens could be detected. The other contents of commercially pure titanium implants such as carbon, iron, nitrogen, oxygen and hydrogen require further evaluations. Patients who were positive for at least one of the 11 microorganisms tested by culture had higher levels of IL-1b, TNF-a, IL-10 and IL-8 at teeth and implant sites. Virulence factors from periodontopathic bacteria (e.g. P. gingivalis) are potent stimulants for the secretion of pro-inflammatory cytokines (IL-1b, TNF-a) and the subsequent activation of matrix metalloproteinases (MMP 2) and other collagenases from gingival fibroblasts.41 Taking into consideration that active IL-b1 and TNF-a mediate a variety of biological functions including osteoclast activation,42 leukocyte recruitment and excessive production of MMPs,43 the overproduction of these cytokines at some time point could lead to bone resorption and collagen degradation. In addition, the production of IL-8 in gingival tissues is an important mechanism of polymorphonuclear neutrophils (PMNs) recruitment and constitutes a first line of immune defense. PMNs produce IL-1b in response to bacterial challenge and act in a paracrine way preventing apoptosis and increasing the phagocytic activity of other PMNs.44 Low counts of PMNs in clinically healthy gingival tissues are a common finding in histological analysis at teeth and implant sites.45 The balance between this innate response and the bacterial challenge is partly responsible for maintaining the health of gingival tissues. Nevertheless, although previous studies have reported that cytokine activity seems to be relevant for alveolar bone resorption and destruction of collagen,46,47 periodontal research to date has not yet established any particular cytokine profile that could be of predictive value for disease progression. Moreover, there is no known cytokine level threshold that could differentiate between a stable site and the initiation of a pathologic process in periodontal and peri-implant tissues. It is important, however, to keep in mind that standard dental radiographs are two-dimensional and do not generally provide information regarding buccal, lingual or palatal bone levels. Assessment of buccal, lingual and palatal attachment levels is accomplished by gentle probing. Many principles and features of maintenance therapy apply to both the natural dentition and to dental implants. In patients who are partially edentulous with implant supported restorations, maintenance visits combine traditional periodontal maintenance for the remaining natural teeth, and dental implant maintenance. In fully edentulous patients with implant supported restorations, the focus is on prevention or treatment of peri-implant mucositis or peri-implantitis, since dental caries and endodontic pathology are not possible. Data collection includes measurement of probing depths, bleeding upon probing, suppuration, recession, mobility, response to percussion and clinical appearance of peri-implant mucosa. Probing should be done with very gentle force, not to exceed 0.15 N; excessive force may disrupt the soft tissue attachment and has been shown to overestimate probing depths and the incidence of bleeding upon probing.50,51 As with natural teeth, inflammation of peri-implant soft tissue results in greater apical penetration of the periodontal probe.52 Hence, gentle probing has been shown to be an effective means to evaluate stability of the peri-implant attachment and to detect the presence of peri-implantitis. Follow-up periapical radiographs are generally taken one year after loading; thereafter the frequency of radiographic evaluation is determined by clinical findings.53 Care should be taken to orient the film or digital sensor parallel to the long axis of the implant fixture – this can require special attention when an angled abutment has been used for the restoration. The appearance of any pain, edema or suppuration would generally indicate the need for radiographic evaluation; otherwise, routine radiographs may be indicated only every few years. Following examination and data collection, peri-implant conditions are documented. Then, instrumentation is performed to reduce or eliminate bacterial plaque and calcified deposits. Standard metal scalers and curettes are not recommended for implant debridement due to the possibility of scratching the titanium surface. In addition to mechanical debridement using scalers and polishing devices, adjunctive local antimicrobial therapy can be administered, although limited and often equivocal evidence of enhanced clinical outcomes has been published.59-64 Irrigation of the peri-implant sulcus with the antiseptic 10% povidone iodine shown in adjacent figure. Home care for dental implant supported restorations is generally similar to traditional oral hygiene procedures with some minor modifications. Plaque control for single implants can be accomplished with a toothbrush and dental floss; numerous studies have suggested that powered tooth brushes may be more effective than manual brushes.94-96 For implant supported fixed partial or complete dentures, floss threaders or interdental brushes are effective in controlling interproximal plaque accumulation.97-99 Interdental brushes with a teflon coated wire are preferred to minimize potential scratching. As with natural teeth, brushing and flossing are effective in disrupting supragingival plaque, with limited benefit in subgingival areas. Oral irrigation devices, particularly those with tips designed to penetrate the sulcus, have been shown to reduce bacterial levels in periodontal pockets and have been advocated as part of patients’ armamentarium for home care of dental implants. Irrigants such as plane water, saline, sea salt solution, chlorhexidine gluconate, and dilute (0.1%) sodium hypochlorite have been suggested by various authors. Based on evidence from periodontitis reports, dilute sodium hypochlorite may be the most effective antimicrobial irrigant for home use, although some patients may object to the odor or taste .100-103 For patients with remaining natural teeth a fluoride containing dentifrice is strongly recommended. As replacement of missing teeth with implant supported restorations has become more common, increasing numbers of patients require dental implant maintenance as part of their preventive or periodontal maintenance care. While dental implants are immune to dental caries, peri-implant mucositis and peri-implantitis can occur, just as gingivitis and periodontitis is seen with the natural dentition. While there are many similarities in etiology, pathogenesis, diagnosis, maintenance therapy and the need for surgical intervention, there are some modifications in instrumentation and home care for patients with implant supported restorations. It is important when initially discussing the option of dental implant treatment that it is understood that while implants have many advantages, they do not absolve the patient from the responsibility of daily oral hygiene procedures or regular recall appointments. 1. Kois JC. The restorative-periodontal interface: biological parameters. Periodontol 2000. 1996 Jun;11:29-38. 2. Vacek JS, Gher ME, Assad DA, Richardson AC, Giambarresi LI. The dimensions of the human dentogingival junction. Int J Periodontics Restorative Dent. 1994 Apr;14(2):154-65. 3. Stern IB. Current concepts of the dentogingival junction: the epithelial and connective tissue attachments to the tooth. J Periodontol. 1981 Sep;52(9):465-76. 4. Marchetti C, Farina A, Cornaglia AI. Microscopic, immunocytochemical, and ultrastructural properties of peri-implant mucosa in humans. J Periodontol. 2002 May;73(5):555-63. 5. Nevins M, Nevins ML, Camelo M, Boyesen JL, Kim DM. Human histologic evidence of a connective tissue attachment to a dental implant. Int J Periodontics Restorative Dent. 2008 Apr;28(2):111-21. 6. Beaumont RH, O'Leary TJ, Kafrawy AH. Relative resistance of long junctional epithelial adhesions and connective tissue attachments to plaque-induced inflammation. J Periodontol. 1984 Apr;55(4):213-23. 7. Schierano G, Pejrone G, Roana J, Scalas D, Allizond V, Martinasso G, Pagano M, Canuto RA, Cuffini AM. A split-mouth study on microbiological profile in clinical healthy teeth and implants related to key inflammatory mediators. Int J Immunopathol Pharmacol. 2010 Jan-Mar;23(1):279-88. 8. Meijndert L, van der Reijden WA, Raghoebar GM, Meijer HJ, Vissink A. Microbiota around teeth and dental implants in periodontally healthy, partially edentulous patients: is pre-implant microbiological testing relevant? Eur J Oral Sci. 2010 Aug;118(4):357-63. 9. Kocar M, Seme K, Hren NI. Characterization of the normal bacterial flora in peri-implant sulci of partially and completely edentulous patients. Int J Oral Maxillofac Implants. 2010 Jul-Aug;25(4):690-8. 10. Van Assche N, Van Essche M, Pauwels M, Teughels W, Quirynen M. Do periodontopathogens disappear after full-mouth tooth extraction? J Clin Periodontol. 2009 Dec;36(12):1043-7. 11. Van Brakel R, Cune MS, Van Winkelhoff AJ, De Putter C, Verhoeven JW, Van Der Reijden W. Early bacterial colonization and soft tissue health around zirconia and titanium abutments: an in vivo study in man. Clin Oral Implants Res. 2010 Nov 3. doi: 10.1111/j.1600-0501.2010.02005. 12. Albrektsson T, Isidor E Consensus report of session W. In: Lang NP, Karring T, ed. Proceedings of the First European Workshop on Periodontology. London: Quintessence, 1994: 365-369. 13. Koldsland OC, Scheie AA, Aass AM. Prevalence of peri-implantitis related to severity of the disease with different degrees of bone loss. J Periodontol. 2010 Feb;81(2):231-8. 14. Zitzmann NU, Berglundh T. Definition and prevalence of peri-implant diseases. J Clin Periodontol. 2008 Sep;35(8 Suppl):286-91. 15. Jung RE, Pjetursson BE, Glauser R, Zembic A, Zwahlen M, Lang NP. A systematic review of the 5-year survival and complication rates of implant-supported single crowns. Clin Oral Implants Res. 2008 Feb;19(2):119-30. 16. Heasman P, Esmail Z, Barclay C. Peri-implant diseases. Dent Update. 2010 Oct;37(8):511-512, 514-516. 17. Máximo MB, de Mendonça AC, Alves JF, Cortelli SC, Peruzzo DC, Duarte PM. Peri-implant diseases may be associated with increased time loading and generalized periodontal bone loss: preliminary results. J Oral Implantol. 2008;34(5):268-73. 18. Arai K, Lee F, Miyajima A, Miyatake S, Arai N, Yokota T. Cytokines: coordinators of immune and inflammatory responses. Annu Rev Biochem 1990;59:783-836. 19. Callard R, George AJ, Stark J. Cytokines, chaos and complexity. Immunity 1999;11:507-513. 20. Baker PJ, Garneau J, Howe L, Roopenian DC. T-cell contributions to alveolar bone loss in response to oral infection with Prophyromonas gingivalis. Acta Odontol Scand 2001;59:222-225. 21. Hultin M, Gustafsson A, Hallström H, Johansson LÅ, Ekfeldt A, Klinge B. Microbiological findings and host response in patients with peri-implantitis. Clin Oral Impl Res 2002;13:349–358. 22. Botero JE, Gonzalez AM, Mercado RA, Olave G, Contreras A. Subgingival microbiota in peri-implant mucosa lesions and adjacent teeth in partially edentulous patients. J Periodontol 2005;76:1490-1495. 23. Menger MD, Vollmer B. Surgical trauma: hyperinflammation versus immunosuppression? Langenbecks Arch Surg 2004;389:475-484. 24. Rogers M, Figliomeni L, Baluchova K, Tan A, Davies, G, Henry P, Price P. Do interleukin-1 polymorphisms predict the development of periodontitis or the success of dental implants? J Periodont Res 2002;37:37-41. 25. Spyrou P, Papaioannou S, Hampson G, Brady K, Palmer R, McDonald F. Cytokine release by osteoblast-like cells cultured on implant discs of varying alloy compositions. Clin Oral Implants Res 2000;13:623-630. 26. di Giovine FS, Poole S, Situnayake RD, Wadhwa M, Duff GW. Absence of correlation between indices of systemic inflammation and synovial fluid interleukin 1 (alpha and beta) in rheumatic diseases. Rheumatol Int 1990;9:259-264. 27. Murray RZ, Kay JG, Sangermani DG, Stow, JL. A role for the phagosome in cytokine secretion. Science 2005;310:1492-1495. 28. Gamonal J, Acevedo A, Bascones A, Jorge O, Silva A. Levels of interleukin-1 beta, -8, and -10 and RANTES in gingival crevicular fluid and cell populations in adult periodontitis patients and the effect of periodontal treatment. J Periodontol 2000;71:1535-1545. 29. Curtis DA, Kao R, Plesh, O, Finzen F, Franz L. Crevicular fluid analysis around two failing dental implants: a clinical report. J Prosthodont 1997;6:210-214. 30. Havemose-Poulsen A, Sorensen L, Stoltz K, Bendtzen K, Holmstrup P. Cytokine profiles in peripheral blood and whole blood cultures associated with aggressive periodontitis, juvenile idiopathic arthritis and rheumatoid arthritis. J Periodontol 2005;76:2276-2285. 31. Dinarello CA. Proinflammatory cytokines. Chest 2000;118:503-508. 32. Ejeil AL, Gaultier F, Igondio-Tchen S, Senni K, Pellat B, Godeau G, Gogly B. Are cytokines linked to collagen breakdown during periodontal disease progression? Periodontol 2000 2004;35:75-100. 33. Yamazaki K, Nakajima N. Antigen specificity and T cell clonality in periodontal disease. Periodontol 2000 2004;35:75-100. 34. Hou R. Goloubeva O, Neuberg DS, Strominger JL, Wilson SB. Interleukin-12 and interleukin-2-induced invariant natural killer T-cell cytokine scretion and perforin expression independent of T-cell receptor activation. Immunology 2003;110:30- 37. 35. Baggiolini M, Walz A, Kunkel SL. Neutrophil-activating peptide-1/interleukin 8, a novel cytokine that activates neutrophils. J Clin Invest 1989;84:1045-1049. 36. Nowzari H, Botero JE, DeGiacomo M, Villacres MC, Rich SK. Microbiology and cytokine levels around healthy dental implants and teeth. Clin Implant Dent Relat Res. 2008 Sep;10(3):166-73. 37. Nowzari H, Phamduong S, Botero JE, Villacres MC, Rich SK. The Profile of Inflammatory Cytokines in Gingival Crevicular Fluid around Healthy Osseointegrated Implants. Clin Implant Dent Relat Res. 2010 Jul 17. 38. Perala DG, Chapman RJ, Gelfand JA, Callahan MV, Adams DF, Lie T. Relative production of IL-1β and TNF-α by mononuclear cells after exposure to dental implants. J Periodontol 1992;63:426-430. 39. Wang JY, Wicklund BH, Gustilo RB, Tsukayama DT. Titanium, chromium and cobalt ions modulate the release of bone-associated cytokines by human monocytes/macrophages in vitro. Biomaterials 1996;17:2233-2240. 40. Sedarat C, Harmand MF, Naji A, Nowzari H. In vitro kinetic evaluation of titanium alloy biodegradation. J Periodontol Res 2001;36:269-274. 41. Grayson R, Douglas CW, Heath J, Rawlinson A, Evans GS. Activation of human matrix metalloproteinase 2 by gingival crevicular fluid and Porphyromonas gingivalis. J Clin Periodontol 2003;30:542-550. 42. Garlet GP, Martins W Jr., Fonseca BA, Ferreira BR, Silva JS. Matrix metalloproteinases, their physiological inhibitors and osteoclast factors are differentially regulated by the cytokine profile in human periodontal disease. J Clin Periodontol 2004;31:671-679. 43. Chang YC, Yang SF, Lai CC, Liu JY, Hsieh YS. Regulation of matrix metalloproteinase production by cytokines, pharmacological agents and periodontal pathogens in human periodontal ligament fibroblast cultures. J Periodontal Res 2002;37:196-203. 44. Fernandez MC, Marucha PT, Rojas IG, Walters JD. The role of protein kinase C and calclum in induction of human polymorphonuclear leukocyte IL-1 beta gene expression by GM-CSF. Cytokine 2000;12:445-449. 45. Berglundh T, Lindhe J, Ericsson I, Marinello CP, Liljenberg B, Thomsen P. The soft tissue barrier at implants and teeth. Clin Oral Implants Res 1991;2:81-90. 46. Stashenko P, Jandinsky JJ, Fujiyoshi P, Rynar J, Socransky, SS. Tissue levels of bone resorptive cytokines in periodontal disease. J Perio 1991;62:504-509. 47. Ishihara Y, Nishihara T, Kuroyanagi T, Shirozu N, Yamagishi E, Ohguchi M, Kolde M, Ueda N, Amano K, Noguchi T. Gingival crevicular interleukin-1 and interleukin-1 receptor antagonist levels in periodontally healthy and diseased sites. J Periodont Res 1997;32:524-529. 48. Vered Y, Zini A, Mann J, Kolog H, Steinberg D, Zambon JJ, Haraszthy VI, Devizio W, Sreenivasan P. Teeth and implant surroundings: clinical health indices and microbiologic parameters. Quintessence Int. 2011 Apr;42(4):339-44. 49. Heitz-Mayfield LJ. Peri-implant diseases: diagnosis and risk indicators. J Clin Periodontol. 2008 Sep;35(8 Suppl):292-304. 50. Eickholz P, Grotkamp FL, Steveling H, Mühling J, Staehle HJ. Reproducibility of peri-implant probing using a force-controlled probe. Clin Oral Implants Res. 2001 Apr;12(2):153-8. 51. Gerber JA, Tan WC, Balmer TE, Salvi GE, Lang NP. Bleeding on probing and pocket probing depth in relation to probing pressure and mucosal health around oral implants. Clin Oral Implants Res. 2009 Jan;20(1):75-8. 52. Lang NP, Wetzel AC, Stich H, Caffesse RG. Histologic probe penetration in healthy and inflamed peri-implant tissues. Clin Oral Implants Res. 1994 Dec;5(4):191-201. 53. Dula K, Mini R, van der Stelt PF, Buser D. The radiographic assessment of implant patients: decision-making criteria. Int J Oral Maxillofac Implants. 2001 Jan-Feb;16(1):80-9. 54. Sato S, Kishida M, Ito K. The comparative effect of ultrasonic scalers on titanium surfaces: an in vitro study. J Periodontol. 2004 Sep;75(9):1269-73. 55. Kawashima H, Sato S, Kishida M, Yagi H, Matsumoto K, Ito K. Treatment of titanium dental implants with three piezoelectric ultrasonic scalers: an in vivo study. J Periodontol. 2007 Sep;78(9):1689-94. 56. Ramaglia L, di Lauro AE, Morgese F, Squillace A. Profilometric and standard error of the mean analysis of rough implant surfaces treated with different instrumentations. Implant Dent. 2006 Mar;15(1):77-82. 57. Mengel R, Buns CE, Mengel C, Flores-de-Jacoby L. An in vitro study of the treatment of implant surfaces with different instruments. Int J Oral Maxillofac Implants. 1998 Jan-Feb;13(1):91-6. 58. Petersilka GJ. Subgingival air-polishing in the treatment of periodontal biofilm infections. Periodontol 2000. 2011 Feb;55(1):124-42. 59. Renvert S, Lessem J, Dahlén G, Lindahl C, Svensson M. Topical minocycline microspheres versus topical chlorhexidine gel as an adjunct to mechanical debridement of incipient peri-implant infections: a randomized clinical trial. J Clin Periodontol. 2006 May;33(5):362-9. 60. Mombelli A. Microbiology and antimicrobial therapy of peri-implantitis. Periodontol 2000. 2002;28:177-89. 61. Porras R, Anderson GB, Caffesse R, Narendran S, Trejo PM. Clinical response to 2 different therapeutic regimens to treat peri-implant mucositis. J Periodontol. 2002 Oct;73(10):1118-25. 62. Heitz-Mayfield LJ, Salvi GE, Botticelli D, Mombelli A, Faddy M, Lang NP; On Behalf of the Implant Complication Research Group (ICRG). Anti-infective treatment of peri-implant mucositis: a randomised controlled clinical trial. Clin Oral Implants Res. 2011 Mar;22(3):237-241. 63. Mombelli A, Feloutzis A, Brägger U, Lang NP. 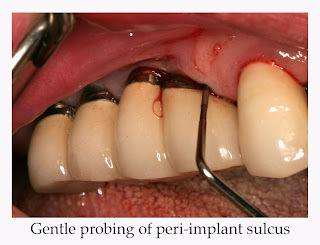 Treatment of peri-implantitis by local delivery of tetracycline. Clinical, microbiological and radiological results. Clin Oral Implants Res. 2001 Aug;12(4):287-94. 64. Zablotsky MH. 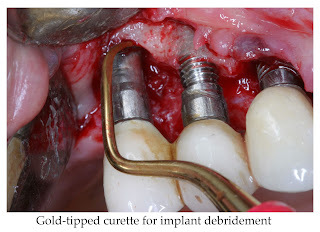 Chemotherapeutics in implant dentistry. Implant Dent. 1993 Spring;2(1):19-25. 65. Aglietta M, Siciliano VI, Rasperini G, Cafiero C, Lang NP, Salvi GE. 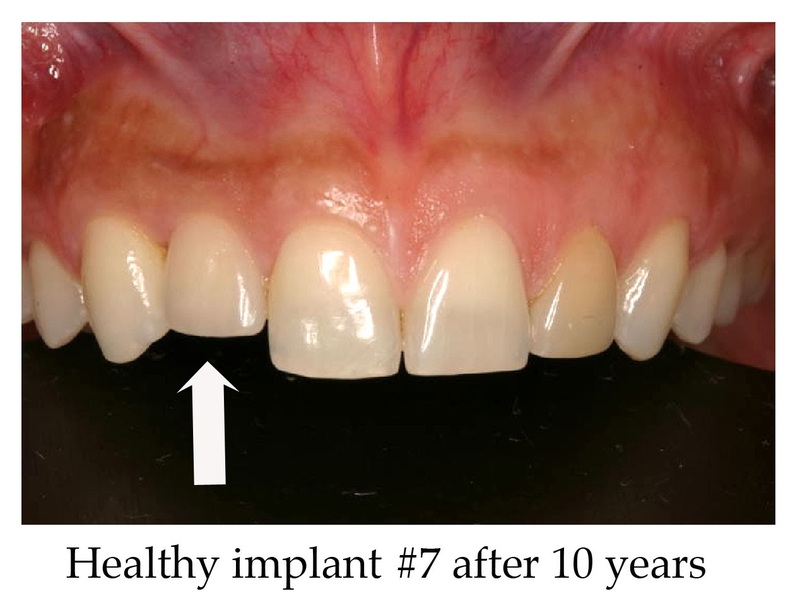 A 10-year retrospective analysis of marginal bone-level changes around implants in periodontally healthy and periodontally compromised tobacco smokers. Clin Oral Implants Res. 2011 Jan;22(1):47-53. 66. Roccuzzo M, De Angelis N, Bonino L, Aglietta M. Ten-year results of a three-arm prospective cohort study on implants in periodontally compromised patients. Part 1: implant loss and radiographic bone loss. Clin Oral Implants Res. 2010 May;21(5):490-6. 67. 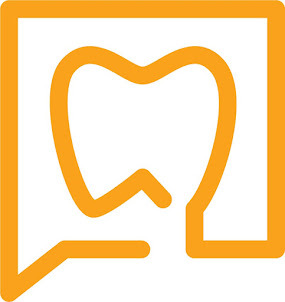 Anner R, Grossmann Y, Anner Y, Levin L. Smoking, diabetes mellitus, periodontitis, and supportive periodontal treatment as factors associated with dental implant survival: a long-term retrospective evaluation of patients followed for up to 10 years. Implant Dent. 2010 Feb;19(1):57-64. 68. Rentsch-Kollar A, Huber S, Mericske-Stern R. Mandibular implant overdentures followed for over 10 years: patient compliance and prosthetic maintenance. Int J Prosthodont. 2010 Mar-Apr;23(2):91-8. 69. García-Bellosta S, Bravo M, Subirá C, Echeverría JJ. 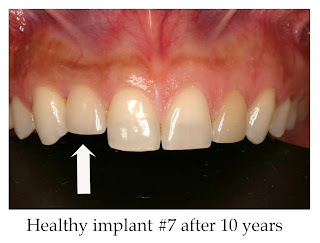 Retrospective study of the long-term survival of 980 implants placed in a periodontal practice. Int J Oral Maxillofac Implants. 2010 May-Jun;25(3):613-9. 70. Grusovin MG, Coulthard P, Worthington HV, Esposito M. Maintaining and recovering soft tissue health around dental implants: a Cochrane systematic review of randomised controlled clinical trials. Eur J Oral Implantol. 2008 Spring;1(1):11-22. 71. Hultin M, Komiyama A, Klinge B. Supportive therapy and the longevity of dental implants: a systematic review of the literature. Clin Oral Implants Res. 2007 Jun;18 Suppl 3:50-62. 72. Humphrey S. Implant maintenance. Dent Clin North Am. 2006 Jul;50(3):463-78. 73. Aglietta M, Siciliano VI, Rasperini G, Cafiero C, Lang NP, Salvi GE. A 10-year retrospective analysis of marginal bone-level changes around implants in periodontally healthy and periodontally compromised tobacco smokers. Clin Oral Implants Res. 2011 Jan;22(1):47-53. 74. Roccuzzo M, De Angelis N, Bonino L, Aglietta M. Ten-year results of a three-arm prospective cohort study on implants in periodontally compromised patients. Part 1: implant loss and radiographic bone loss. Clin Oral Implants Res. 2010 May;21(5):490-6. 75. Anner R, Grossmann Y, Anner Y, Levin L. Smoking, diabetes mellitus, periodontitis, and supportive periodontal treatment as factors associated with dental implant survival: a long-term retrospective evaluation of patients followed for up to 10 years. Implant Dent. 2010 Feb;19(1):57-64. 77. Schwarz F, Sahm N, Iglhaut G, Becker J. .Impact of the method of surface debridement and decontamination on the clinical outcome following combined surgical therapy of peri-implantitis: a randomized controlled clinical study. J Clin Periodontol. 2011 Mar;38(3):276-84. 78. Kotsovilis S, Karoussis IK, Trianti M, Fourmousis I. Therapy of peri-implantitis: a systematic review. J Clin Periodontol. 2008 Jul;35(7):621-9. 79. Sahrmann P, Attin T, Schmidlin PR. Regenerative treatment of peri-implantitis using bone substitutes and membrane: a systematic review. Clin Implant Dent Relat Res. 2011 Mar;13(1):46-57. 80. Claffey N, Clarke E, Polyzois I, Renvert S. Surgical treatment of peri-implantitis. J Clin Periodontol. 2008 Sep;35(8 Suppl):316-32. 81. Lindhe J, Meyle J; Group D of European Workshop on Periodontology. Peri-implant diseases: Consensus Report of the Sixth European Workshop on Periodontology. J Clin Periodontol. 2008 Sep;35(8 Suppl):282-5. 82. Esposito M, Grusovin MG, Coulthard P, Worthington HV. The efficacy of interventions to treat peri-implantitis: a Cochrane systematic review of randomised controlled clinical trials. Eur J Oral Implantol. 2008 Summer;1(2):111-25. 83. Kotsovilis S, Karoussis IK, Trianti M, Fourmousis I. Therapy of peri-implantitis: a systematic review. J Clin Periodontol. 2008 Jul;35(7):621-9. 84. Bürgers R, Gerlach T, Hahnel S, Schwarz F, Handel G, Gosau M. .In vivo and in vitro biofilm formation on two different titanium implant surfaces. Clin Oral Implants Res. 2010 Feb;21(2):156-64. 85. Elter C, Heuer W, Demling A, Hannig M, Heidenblut T, Bach FW, Stiesch-Scholz M. Supra- and subgingival biofilm formation on implant abutments with different surface characteristics. Int J Oral Maxillofac Implants. 2008 Mar-Apr;23(2):327-34. 86. Scarano A, Piattelli A, Polimeni A, Di Iorio D, Carinci F. Bacterial adhesion on commercially pure titanium and anatase-coated titanium healing screws: an in vivo human study. J Periodontol. 2010 Oct;81(10):1466-71. 87. Karbach J, Callaway A, Kwon YD, d'Hoedt B, Al-Nawas B. Comparison of five parameters as risk factors for peri-mucositis. Int J Oral Maxillofac Implants. 2009 May-Jun;24(3):491-6. 88. García-Bellosta S, Bravo M, Subirá C, Echeverría JJ. 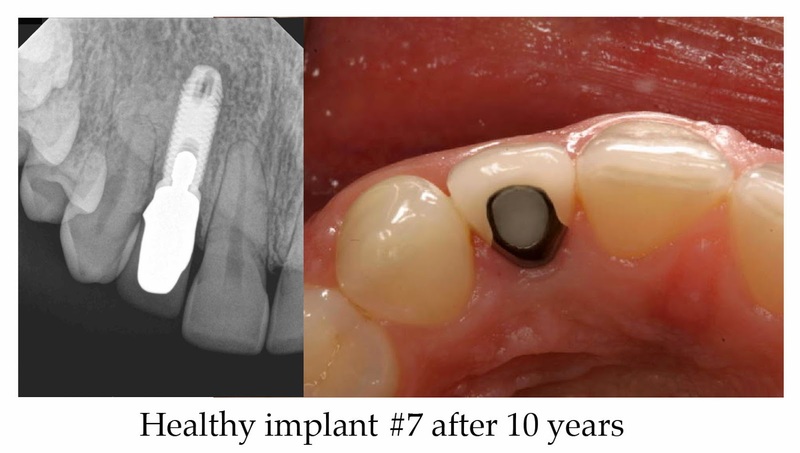 Retrospective study of the long-term survival of 980 implants placed in a periodontal practice. Int J Oral Maxillofac Implants. 2010 May-Jun;25(3):613-9. 89. George K, Zafiropoulos GG, Murat Y, Hubertus S, Nisengard RJ. Clinical and microbiological status of osseointegrated implants. J Periodontol. 1994 Aug;65(8):766-70. 90. Amarante ES, Chambrone L, Lotufo RF, Lima LA. Early dental plaque formation on toothbrushed titanium implant surfaces. Am J Dent. 2008 Oct;21(5):318-22. 91. Lang NP, Bosshardt DD, Lulic M. Do mucositis lesions around implants differ from gingivitis lesions around teeth? J Clin Periodontol. 2011 Mar;38 Suppl 11:182-7. 92. Ohrn K, Sanz M. Prevention and therapeutic approaches to gingival inflammation. J Clin Periodontol. 2009 Jul;36 Suppl 10:20-6. 93. Vered Y, Zini A, Mann J, Kolog H, Steinberg D, Zambon JJ, Haraszthy VI, DeVizio W, Sreenivasan P. Teeth and implant surroundings: clinical health indices and microbiologic parameters. Quintessence Int. 2011 Apr;42(4):339-44. 94. Truhlar RS, Morris HF, Ochi S. The efficacy of a counter-rotational powered toothbrush in the maintenance of endosseous dental implants. J Am Dent Assoc. 2000 Jan;131(1):101-7. 95. Vandekerckhove B, Quirynen M, Warren PR, Strate J, van Steenberghe D. The safety and efficacy of a powered toothbrush on soft tissues in patients with implant-supported fixed prostheses. Clin Oral Investig. 2004 Dec;8(4):206-10. 96. Cagna DR, Massad JJ, Daher T. Use of a powered toothbrush for hygiene of edentulous implant-supported prostheses. Compend Contin Educ Dent. 2011 May;32(4):84-8. 97. Eskow RN, Smith VS. Preventive periimplant protocol. Compend Contin Educ Dent. 1999 Feb;20(2):137-52. 98. DuCoin FJ. Dental implant hygiene and maintenance: home and professional care. J Oral Implantol. 1996;22(1):72-5. 99. Lord BJ. Maintenance procedures for the implant patient. Aust Prosthodont J. 1995;9 Suppl:33-8. 100. Potting CM, Uitterhoeve R, Op Reimer WS, Van Achterberg T. The effectiveness of commonly used mouthwashes for the prevention of chemotherapy-induced oral mucositis: a systematic review. Eur J Cancer Care (Engl). 2006 Dec;15(5):431-9. 101. Michel J, Michel M, Nadan J, Nowzari H. The Street Children of Manila are affected by Early-in-life Periodontal Infection: Description of a Treatment Modality: Sea Salt. Journal de Parodontologie et d'Implantologie Orale. 2011 – in press. 102. Felo A, Shibly O, Ciancio SG, Lauciello FR, Ho A. 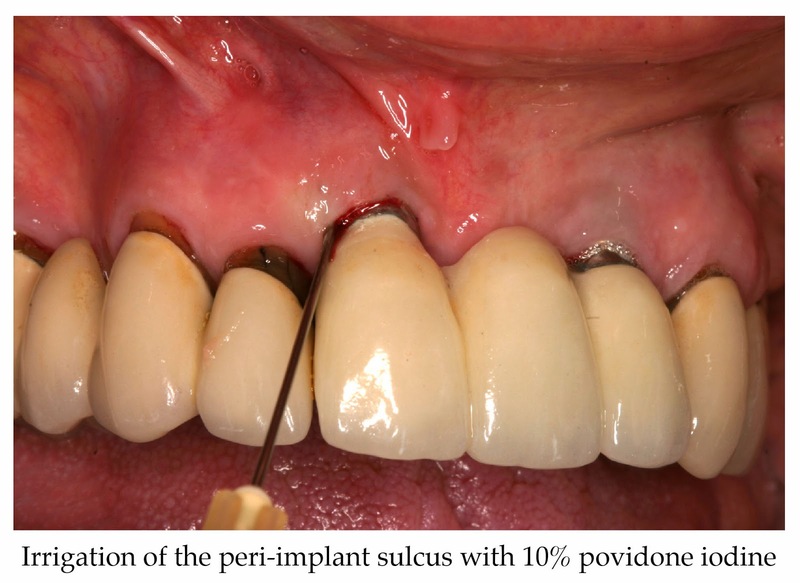 Effects of subgingival chlorhexidine irrigation on peri-implant maintenance. Am J Dent. 1997 Apr;10(2):107-10. 103. Slots J. Selection of antimicrobial agents in periodontal therapy. J Periodontal Res. 2002 Oct;37(5):389-98. Thanks for this post. we can access full dental implant upkeep services from this post. It gives extremely instructive tips of dental implant. Great blog, very well written and informative. I liked how you incorporated images to make your explanations more elaborate. Dental implants should be monitored by your dentists.